Hurricane Maria, a Category 4 storm with 155 mph winds, tore through the island of Puerto Rico in September. The massive and deadly hurricane destroyed thousands of homes and initially killed 64 people, and may indirectly be responsible for many more. 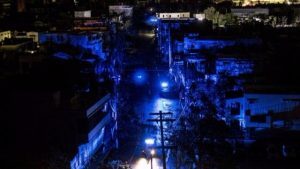 It also devastated the island’s electrical infrastructure, leaving 3.4 million people — virtually every inhabitant in Puerto Rico — without power. Now, five months later, some 400,000 people on the island are still without power. It is the largest blackout in U.S. history. So, why is it taking so long to restore power and get the grid back in operation? Unfortunately, Puerto Rico’s electric grid was fragile to begin with, and the utility that supplies power to the entire island is government-owned. According to various news accounts, Puerto Rico Electric Power Authority (PREPA) is laden with debt and riddled with corruption. At the same time, the island’s infrastructure is old and in dire need of replacement. Many power plants that generate electricity are obsolete and inefficient. Basically, the entire electric grid must be rebuilt from scratch. The people of Puerto Rico are now realizing the importance of having a “resilient” grid. Resilience is all about reducing the magnitude and duration of disruptive events, including the capability to anticipate, absorb and adapt to events — and quickly recover. In the mainland United States, we are blessed with the most reliable and affordable electricity in the world. We become impatient when our electric service is interrupted for even a few hours. But five months? Most of us cannot even fathom such a scenario. However, we do see inklings of problems with our electric grid, especially during the winter months. During the recent, extended cold snap and “bomb cyclone” that hit the northeast in January, Bloomberg News reported that portions of the nation’s electric grid were strained — with power plants churning in overdrive to meet heavy demand. Energy prices soared. As that frigid weather demonstrated, it’s a very good thing to have sturdy, baseload power like coal and nuclear on hand when it’s suddenly needed. Thankfully, there are folks in Washington who understand the importance of grid resilience. Energy Secretary Rick Perry has identified this pressing concern for the nation’s power sector. In response, he proposed that the Federal Energy Regulatory Commission (FERC) give added weight to baseload coal and nuclear plants that maintain on-site fuel supplies — and thus can run independently and long-term to shoulder the weight of a heavily taxed power grid. While FERC declined to pursue his specific recommendations, it did open a proceeding to look at overall grid resilience, and will consider Perry’s proposal as well as other ideas to keep our grid safe. Officials in Puerto Rico expect power to be restored to 95 percent of customers across the island by April. Unfortunately, restoring service in more rugged areas may take until late May. Hopefully, Puerto Rico’s electricity will come back online as soon as possible, and its citizens will be able to take up their lives again. Going forward, however, Puerto Rico faces the equally formidable task of modernizing its electric grid to withstand future challenges. Overall, such a shortage of electricity means ongoing difficulties. As Washington looks at the problems that Puerto Rico has faced, policymakers will hopefully take note that the safety and security of a nation’s electric grid should never be taken for granted.